Today May 30 marked the highest recorded downtrend of the Philippines stock market , marking the worst single-day bloodshed in two years. We're down by 275.22 points - 3.81% down compared to yesterday's index. Stock market index slides below 7,000. Good news! as what Kuya Bo mentioned last Monday when it went down to 7097.51. On his Stock Market Alert via email... he said..."At last! After a long wait, our Stocks finally went down." It closed to 6,953.35 today, as a result more cheap stocks to buy this time. Tama o tama? Yahoo! "In Asia, Japan's Nikkei 225 index fell 5.15% to 13,589.03. South Korea's Kospi lowered 0.05% to 2,000.10. Mainland China's Shanghai Composite benchmark declined 0.27% to 2,317.75. Benchmarks in Singapore, Taiwan, Indonesia, and the Philippines also fell." 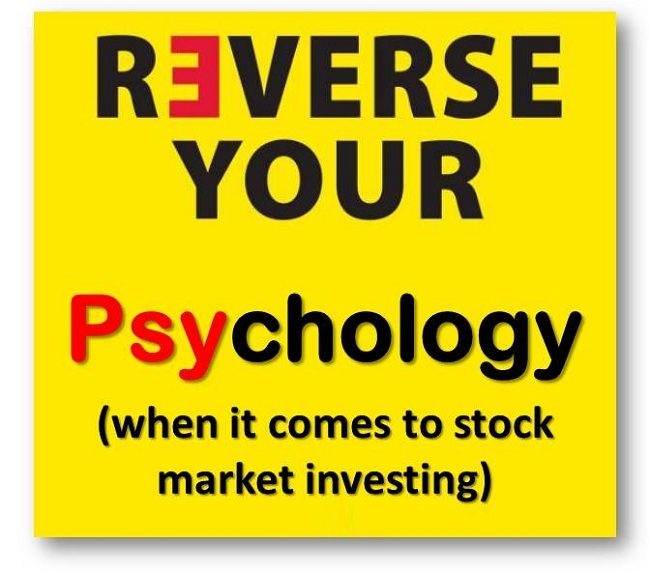 I keep embedding this in my mind ever since I joined the Truly Rich Club, the same stock market investing psychology I shared to you last time, "Reverse Your Psychology in terms of stocks investing" Consider it GOOD NEWS every time it goes down. Again, remember that we are following the strategy of long term investing. 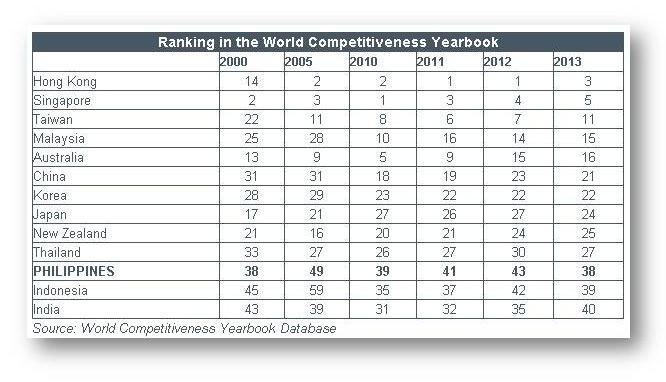 Here's another GOOD NEWS, based on Rappler news website, "In this year’s World Competitiveness Yearbook (WCY), the Philippines climbed 5 notches compared to 2012, from 43rd to 38th (ranked out of 60 countries)." "First the good news: the Philippines is now ranked 38th in the World Competitiveness Yearbook (WCY) sample of 60 countries. Now the not-so-good news: we were 38th already in 2000, so we still have a long way to go. The country has reversed an over-decade-long decline in its ranking. The Philippines is now 11th among Asia Pacific countries in the WCY sample (compared to 13th in 2009), overtaking both India and Indonesia." This only shows that the Philippines is doing great. Let's continue to thrive and support each other and support our government on its mandate to serve more Filipinos for the better Philippines. One more thing about Truly Rich Club Review. Good thing we have this regular Stock Market Update from The Truly Rich Club. 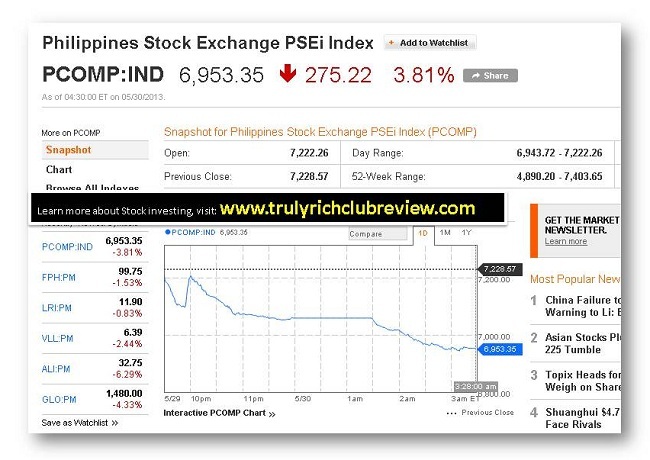 Below is an email update from Kuya Bo last May 27, he said.. "Stock Alert: Stocks Went Down—Rejoice!" Subject: Stock Alert: Stocks Went Down—Rejoice! At last! After a long wait, our Stocks finally went down. It’s soooooo nice to see some of my SAM Stocks go “Red”! KEEP putting small amounts of money into these same Stocks. buck. We’re after the slow but sure bonanza! By the way, the Philippine Stock Market isn’t the only one that’s down. The world markets are down. The Japanese Stock Market is down too—by 10%. When people are panicking, that’s the time to buy our SAM Stocks. those small amounts will become big amounts.